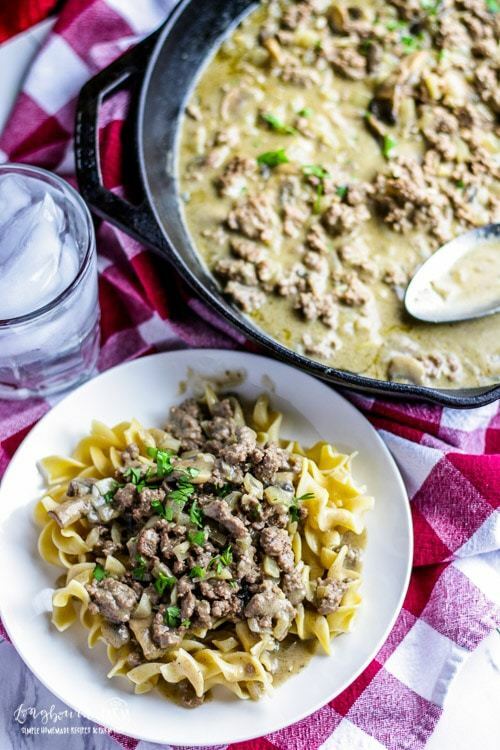 Easy Beef Stroganoff is packed with flavor and so delicious. It’ll be the best homemade beef stroganoff recipe you ever make and the whole family will love it. In a large skillet, melt 1 tablespoon butter. Brown beef, remove from skillet and set aside. If there is a lot of excess grease, remove it. Sauté onions and mushrooms until soft and starting to turn golden, about 3-4 minutes. Add sage and flour and stir until flour is cooked a bit, about 2 minutes. Add beef broth, stirring constantly. Stir in Worcestershire sauce, soy sauce, and the beef along with any accumulated juices. Simmer on low heat until thickened, flavors have melded, and beef is cooked through, about 10 minutes. Be sure it's not burning or sticking on the bottom by stirring occasionally. Off heat, stir in cream and sour cream until combined. You can use beef chunks of any kind or ground beef in this recipe. The beef chunks will be more tender if you use a nicer cut of meat. I have used beef stew chunks in the past, but they can be tough. Cooking them longer will help. We actually love this recipe with ground beef, just be sure to drain off the excess grease. I also love using leftover beef in this recipe. It's a great way to use leftover steaks, roast, or anything other leftover cut you don't want to waste. Just omit steps 1 and 2 and start by sautéing the onions. 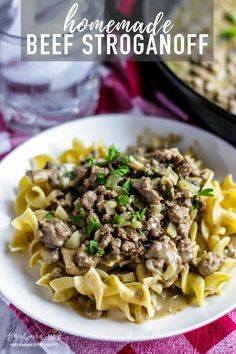 0 Response to "Homemade Easy Beef Stroganoff"